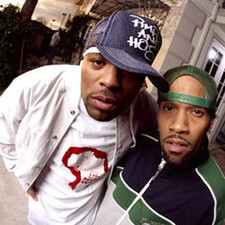 Method Man & Redman will soon hit the road and reprise the tag-team dynamics that dazzled crowds during Rock the Bells this summer. Boston rapper Termanology and Alchemist & Evidence (who just formed a new supergroup called the Step Brothers) will lend support. Meth & Red are also in the final stages of recording a new album together, Blackout 2, that’s tentatively scheduled for a December 9 release on Def Jam. But will the recording process throw the tour off? I find it unlikely — at this stage of their career, the duo probably gets most of its weed money through tours. But the following MySpace bulletin, which each rapper sent out separately on October 8, seems strange. As a result, the tour has been pushed back from its former October 10 launch to October 17, and many of the concerts have been rescheduled. But it appears as if the tour is still on for now. I’ll let you know if that changes. Redman and Method man have fucked up. They have actually found the two dudes who smoke more weed than they do to open up for them. The promoters booked us as the opening act for the Still High tour. They think we are going to come out and rap. This has absolutely nothing to do with rap. A no holds barred, bong smashing, blunt exploding cheeba slugfest. Now, see, we practice every sport. But when it comes to the Bong we are, humbly, untouchable. Dude sounds like he was high when he wrote that. This entry was posted in News and tagged Evidence, Method Man, Redman, Termanology, the Alchemist. Bookmark the permalink.